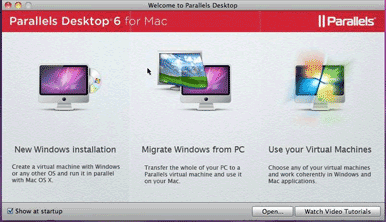 On Thursday, Parallels announced the latest version of its virtualization software, Parallels Desktop 6 for Mac. The software allows Mac users to run Windows within Mac OS X. The company says that Parallels Desktop 6 has over 80 new features and improvements. Key to Parallels Desktop 6 is increased speed. In addition to faster performance when handling files over USB or on a network, the company says that the new software can boot Windows 41 percent faster than the previous version, and 3D graphics performance gets a 40 percent increase. Parallels Desktop 6 also has full 64-bit support. "With Parallels Desktop 6, gaming and graphics was a priority," said Jack Zubarev, President of Marketing and Alliances for Parallels in a press conference. In addition to the graphics enhancements, Parallels Desktop 6 now supports 5.1 surround sound. Parallels Desktop 6 also has new security features. Parental controls now work so that the setting you apply on your Mac are also carried over to Windows. The virtual machine encryption feature helps maintain the privacy of your data. Parallels also provides the Kaspersky Internet Security 2011 (Windows) and Kaspersky Anti-Virus for Mac software packages, as well as the Acronis True Image Home 2010 backup and file recovery program, and Acronis Disk Director 2011 Home hard drive utility (both for Windows). Other new features include the ability to use Mac OS X keyboard shortcuts in Windows and the ability to use Spotlight to find Windows programs. Parallels Desktop 6 will be available on September 14 for $80. A student version will be available for $40. Parallels Desktop 6 for Mac will also be packaged in a $100 Switch to Mac bundle targeted at new Mac users who are switching from a Windows PC computer. The Switch to Mac bundle includes a USB cable for transferring files between a Mac and PC. Existing Parallels users can upgrade to version 6 for $50. If you bought Parallels Desktop 5 for Mac after August 15 from an authorized dealer, you will be able to upgrade to version 6 at no additional cost.